Optimization is an appealing way to compute the motion of an animated character because it allows the user to specify the desired motion in a sparse, intuitive way. The difficulty of solving this problem for complex characters such as humans is due in part to the high dimensionality of the search space. The dimensionality is an artifact of the problem representation because most dynamic human behaviors are intrinsically low dimensional with, for example, legs and arms operating in a coordinated way. We describe a method that exploits this observation to create an optimization problem that is easier to solve. Our method utilizes an existing motion capture database to find a low-dimensional space that captures the properties of the desired behavior. We show that when the optimization problem is solved within this low-dimensional subspace, a sparse sketch can be used as an initial guess and full physics constraints can be enabled. We demonstrate the power of our approach with examples of forward, vertical, and turning jumps; with running and walking; and with several acrobatic flips. Alla Safonova, Jessica K. Hodgins, Nancy S. Pollard (2004). 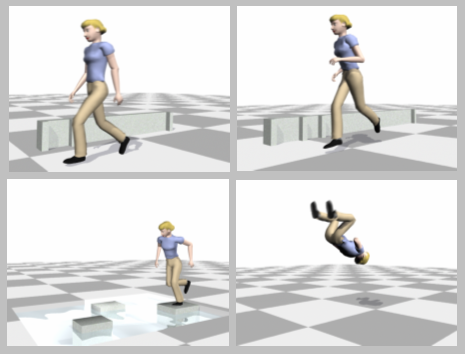 Synthesizing Physically Realistic Human Motion in Low-Dimensional, Behavior-Specific Spaces. ACM Transactions on Graphics / SIGGRAPH 2004, 23(3).